As promised, the why we make such an effort to get images on our iPads and clean them up for work. We do a lot of documents on our iPads. It is quick to use a finger to move things around, zoom in/out with two fingers, rotate, place and then type the text to go around it. The instant on of the iPad means that we can edit on the run. Elevator time is actual real work time. Ride a bus or train, no Internet needed to get a lot of work done quickly without taking our the notebook. First off, Pages from Apple. Many years ago, we all carried our Apple 2300 and 2400 mini notebooks around with Pagemaker on them. We could toss in a picture, types some text, flow the two together on a page and distribute out a document while completely being mobile. The next presentation or letter came along, it was simple enough to duplicate the document and type in the new text. That is where we are at these days with Pages on a iPad, except even more mobile now and even easier to share out the final document. Pages has many templates available to build off of, customizing as you need. Or, you can create your own. 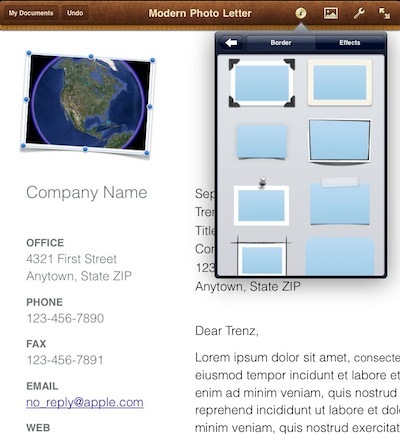 Templates can be shared to other team members to you carry a common look and feel with all communications. Just tap the text on the page and type the message that document needs. Using images – after tuning your images as we discussed in our previous posts this week, you will be ready to insert it into a document. Like the desktop version of Pages, you can grab the corners and make your images larger/smaller and move them around the page to fit your needs. Selecting the image, you can add a boarder or shadow to create the desired effect you wish to carry with the document when you distribute it later. 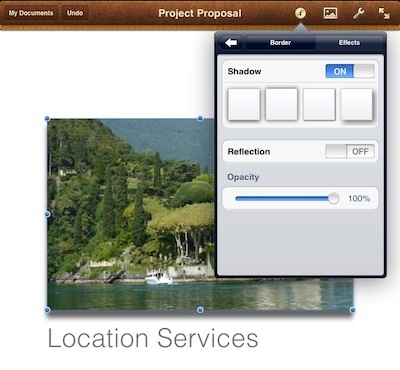 Adding a shadow to the image carries with it the ability to fine tune. As you would expect with a page editor on your desktop, many features are found in Pages, all done with your fingertip. When creating a piece of stationary in Pages for writing letters with, you can add a bit of uniqueness to your images by using one of the available boarders. You can use the stationary over and over again, Customizing to the particular needs at that time through the built-in ability to add and edit more than text. 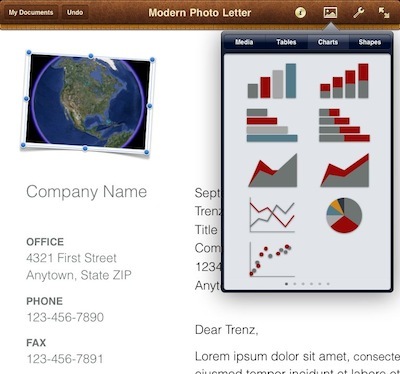 You can also insert tables, charts and shapes (Apple’s FAQ on using Tables, Charts and Shapes). 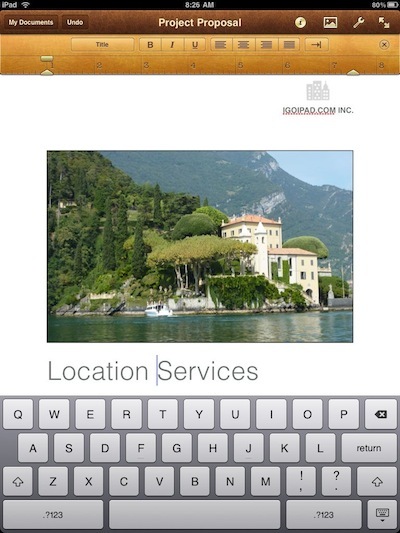 The text editing in Pages works well, with many of the standard features you would expect to be able to use. For very long documents, rather than working with text flowing from page to page, we will use Documents To Go to type and edit the message. 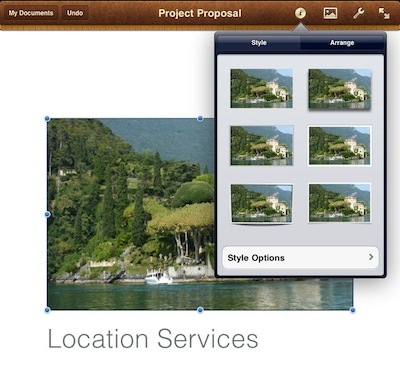 Then, paste that text into a Pages document, adding images throughout for maximum impact. Images wrapped in text will always carry more of an impression then pages of text.